Behold the latest ocular assault weapon from the Graffiti Research Lab, openFrameworks and The Ebeling Group: The EyeWriter. 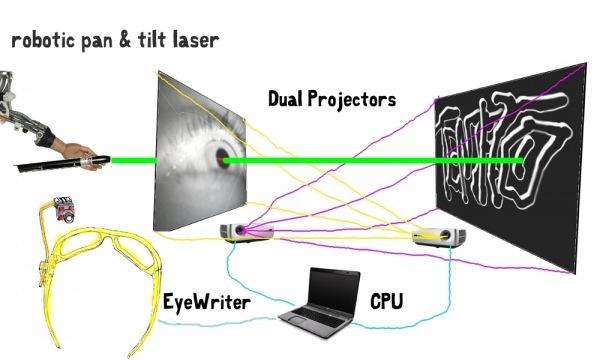 It is a low-cost eye-tracking apparatus + custom software that allows graffiti writers and artists with paralysis resulting from Amyotrophic lateral sclerosis to draw using only their eyes. The EyeWriter project is on ongoing collaborative research effort to empower people, who are suffering from ALS, with creative technologies. The project began in Los Angeles, Caifornia in 2009, when members of the GRL, FAT, OF and TEG communities teamed-up with a legendary LA graffiti writer, publisher and activist, named Tony Quan, aka TEMPTONE. Tony was diagnosed with ALS in 2003. The disease has left him almost completely physically paralyzed… except for his eyes. But, the ALS hasn’t touched Tony’s sharp mind, creative energy or his desire to write graffiti. In August of 2009, artist from around the world: London, Hong Kong, Madrid, Amsterdam and New York City, converged for 10 days in southern California, converted Mick and Caskey Ebeling’s Venice Beach house into a laboratory and began to work with Tony on a low-cost, open source eye-tracking system that would allow ALS patients to draw using just their eyes. 10 days later the EyeWriter 1.0 prototype was finished. This system is constructed from material found in local Venice Beach hardware and electronics stores and the software is written using an open source set of C++ libraries for creative coding from openFrameworks. Phase 1 of development culminated on April 12th when TEMPT drew his tag for the first time in over 5 years. His tags were transmitted in real-time and projected outside on a wall he could see from his hospital room window. Tempts first count of “eye vandalism” in real elapsed time, using a GRL MBU, two wireless broadband USB sticks, the mytobii eye tracking systems and custom software Zach wrote in the back of the Wildcat. Tempt’s throw-up from the 80’s and his first “eye-tag” in 2009. The output of the Phase 1 research effort was conclusive: a low-cost, DIY system can be made that will allow ALS patients, with the help of their family and caregivers, to make visual art. Furthermore, it was demonstrated that when combined with Mobile Broadcast Units, or similar outdoor projection system, a networked version of the EyeWriter can enable patients to have a large-scale, uncurated presence in public spaces. Thanks to Parsons Communication, Technology + Design program and TEG, Phase 2 of the EyeWriter project will begin in August. 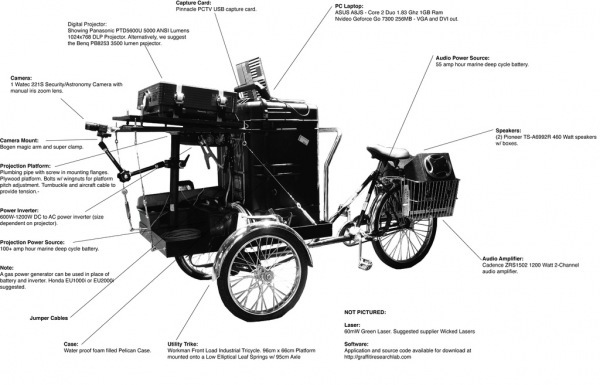 The goal will be a stable 2nd prototype and the online publication of DIY instructions, open source software and video documentation of the project (available in September 2009). The long-term goal is to create a professional/social network of software developers, hardware hackers, urban projection artist and ALS patients from around the world who are using local materials and open source research to creatively connect and make eye art. Zach profiling his latest developments in NYC: the PS3 Eye cam hack. The following texts, photos and videos document the 10-day, Phase 1 development of the EyeWriter in Los Angeles, California from April, 2rd to the 12th. Phase 2 begins August 16th. Stay tuned for daily updates on FAT and openFrameworks. The EyeWriter will be featured in upcoming exhibitions in Canada (CAFKA), Japan (CREAM) and Paris in 2009 and 2010. 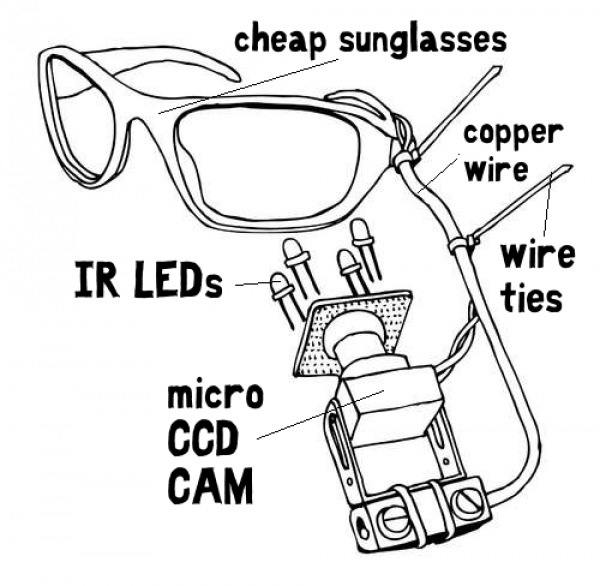 COMPONENTS: cheap sunglasses, a micro CCD camera, IR LEDs, misc electrical hardware and electrical components, custom software written in openFrameworks, capture card, laptop, projector (optional) and wireless broadband USB sticks (optional). THE TEAM: Zach Lieberman, Tony Quan, Chris Sugrue, Theo Watson, Evan Roth, James Powderly and The Ebeling Group. Special thanks to Parsons Communication, Design + Technology, LM4K, Eleanor Dunk and the Quan Family. THE FLICKS: FAT fuckflickr page, Theo’s B&W flicks. Eye Toy preview from james powderly on Vimeo. F@ Day #2 in Los Angeles from Evan Roth on Vimeo. Day #03- KanEye Tracking from Evan Roth on Vimeo. Day #4: Mo’ Pupils Mo’ Problems from Evan Roth on Vimeo. Day #5: 800s and Hardware from Evan Roth on Vimeo. Day #6: From Beyond from Evan Roth on Vimeo. Day #7: Tracking Updates from Evan Roth on Vimeo. Day #8: Introductions from Evan Roth on Vimeo. Last year me and Evan met a guy named Mick. Mick had an idea. It seemed a little… you know… out there. He told us about a man named Tony, a graffiti writer, who needed our help. He said Tony had a real bad disease. Said he couldn’t move a muscle, that the disease had only spared his eyes. Said maybe WE could help him to write again. And we were arrogant or foolish enough to think maybe, with the help of our friends, that we could. But in the end, something unexpected happened. It was Easter and there was an actual miracle. Because at the end of the day, it was Tony who helped all of us: he helped us to know hope, showed us what it means to be strong, to be a survivor, to be a graffiti writer, to be alive. It was his father, mother, brother and crew who showed us the meaning of the word family. It was the Ebelings who showed us what it means to have a vision. It was through Tony’s eyes that we finally saw what graffiti was really all about. So, consider this the beginning, these words an introduction. If you don’t already know him, let me tell you about my hero. His mama named him Tony. The streets crowned him Tempt. The disease said he was finished. But me and my crew, we call him the Eye Writer: a living legend, the first man to bomb with his eyes. Stay tuned to FAT and GRL, in the next few weeks, to see the whole story, to learn more about TemptOne in his own words, to find out about the EyeWriter V1.0 and to become a part of the project to enable other heroes all over the world, surviving ALS, to once again make art.